We’d love your help. Let us know what’s wrong with this preview of Farmyard Beat by Lindsey Craig. To ask other readers questions about Farmyard Beat, please sign up. You too will catch the beat of this fun and rhythmic story! A great read aloud that will have both child and adult singing and dancing along. A fun book about animals who just "can't sleep 'cause they got that beat!" The beat of one animal segues into the next animal who can't sleep. The sheep - "TAT! TAT! Tattity-tat-tat! All that racket wakes up...Cat!" With a foot-stompin' beat and colorful and fanciful collage pictures, this is loads of fun. This board book is great for all ages- The illustrations by Marc Brown are bright and colorful, created by utilizing a collage of various shapes and textures. Repetition of words and predictability of the story line make it a fun read aloud for the very young. Lots of opportunities for counting, shape and color recognition. Find Farmyard Beat at the Westminster Public Library! Great book for animal noises and talking about beat/rhythm. 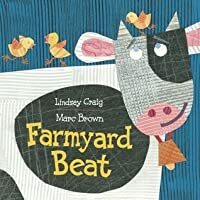 Farmyard Beat by Lindsey Craig is a children’s picture book. The age group this book is intended for is nursery. The book has a rhythm in the writing and it describes all the animals coming together because they have a beat that make them want to dance. I read this book electronically. The illustrations by Marc Brown used a lot of lines for details; the background sky looked in motion. The colors were bright and the animals were drawn at different angles to show motion in their dancing. Craig us Farmyard Beat by Lindsey Craig is a children’s picture book. The age group this book is intended for is nursery. The book has a rhythm in the writing and it describes all the animals coming together because they have a beat that make them want to dance. I read this book electronically. The illustrations by Marc Brown used a lot of lines for details; the background sky looked in motion. The colors were bright and the animals were drawn at different angles to show motion in their dancing. Craig used repetition and rhyming in the words and I thought she was going with the vocal sounds that the animals make, but not for the sheep and the cow. She made the sheep go “Tat!Tat! Tattitty-tat-tat!” which could be their hooves on the ground when they were dancing, but I think it would have been better with the consistency of the vocal noises of the animals. The ending was that after all the excitement they all fell asleep. Overall, I feel this is a good book for young readers. I think a child would probably get up and dance with the animals. The electronic version of the book was set up just as the book would have been; however, I still prefer the ink-on-paper version of the book. Wonderful rhyming text that has all the animals in the barnyard up late at night, keeping the rhythm as they dance around the farmyard. Wonderful sound words and repetitive text for young readers. Great read aloud for PK-1 students. Collage art by Marc Brown creates depth to the farm animals as they dance around. In one word: rhythmic! The farmyard animals can't sleep because they just can't quiet the beat making its way across the farm. The cut paper illustrations are big and bright and all the animal noises will make this a very fun storytime read. Farm animals wake up in the night to make some noise. The farmer joins them, then they all dance until they pass out sleep. Sounds simple, but the book is chock full of fun rhymes, rhythms that incite movement and singing…or at least in me! Cute and incredibly catchy! The many different sounds that the animals make are very creative and fun. Colorful and fun. Great choice for a read aloud. Craft activity: making drums & shakers from styrofoam cups. Shakers had some trouble due to glue taking longer to dry than anticipated. Farmyard Beat was the biggest hit from this storytime. They had a great time shouting out the names of the different animals as we turned the pages, and the rhythm of this book encourages dancing and wiggling. Fun fun fun! An adorable book that will have younger readers laughing in delight. It is so clever and fun. 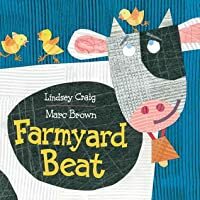 A book that brings the farm to life with a catchy beat! I cannot wait to use this book in my classes. Such a fun board book that is sure to become your child's favorite read-a-loud because it has a sing songy text. A great read. perfect for guessing the animals... it's got a rhythm... it's got rhyming... action and at the end... sleeping. toddlers or preschool appropriate. get them involved!! This book is so much fun to read -- it has a wonderfully lyrical rhythm. I really like the cubist inspired illustrations too. Fun farmyard animal book. Told in a nice rhythm and rhyme. The text can be a little hard to read at times because of the background. TO READ/SING: During Toddler Time and Preschool Play. Fun rhyming book about all the animals who can't sleep. The illustrations are collages that look like many are made of corrugated paper. Cute story about farm animals that can't sleep because they got that beat. In the end....they get some sleep. So much fun, with a great rhythm. I like to ask the groups I read it to what the new animal is on each page. Awesome! Like a rap song, almost, with the way the perfect rhythm helps you read the story at a fun pace. Also, fun to guess the next animal based on predictive rhyming. Perfect for a toddler. My daughter loved the rhymes, the sounds, and the bright, colorful mixed media illustrations. Peep-peep-peep! I love reading this one aloud! Really fun to read with my 2yo! The rhythm of the words through me off. Fun book for rhyming and for cross curricular literacy in the music classroom. It needs a link to a song or something, like Pete the Cat. Fantastically fun! Used for preschool springtime storytime on 5/9/18. I gave the kids maracas to shake as I read it and they got a kick out of that. Lindsey Craig is the author of the award winning books: DANCING FEET and FARMYARD BEAT both illustrated by Marc Brown. Her books have won numerous awards and been highly praised by Kirkus Review (starred), Publisher Weekly and the New York Times Book Review; her awards include: NAAPA Gold Award Winner, Fred Rogers Best Baby Books 2011, Wilde Award Best Children’s Books, and inclusion in Texas 2X2 Lindsey Craig is the author of the award winning books: DANCING FEET and FARMYARD BEAT both illustrated by Marc Brown. Her books have won numerous awards and been highly praised by Kirkus Review (starred), Publisher Weekly and the New York Times Book Review; her awards include: NAAPA Gold Award Winner, Fred Rogers Best Baby Books 2011, Wilde Award Best Children’s Books, and inclusion in Texas 2X2 Reading List. She has published numerous alphabet and beginning readers for CJ Educations, and has just produced her first science app SOLAR SYSTEM SILLIES!. Her most recent books include the not-so-quiet: OH SO QUIET!, and the colorful and encouraging board books: TRY! TRY! TRY! and IN OUR TREE. Lindsey lives with her family and fat black cats on a beautiful island in Washington State.